Garth Brooks and Trisha Yearwood are on the last leg of a three-year world tour. Let that sink in… three years… on tour… OnStage Magazine caught the Saturday night show (one of five at the Pan Am in Las Cruces, NM) and loved it as much as the boisterous crowd. In most cities, they stay for two and three days, performing an afternoon and evening set. Garth joked about his weight, but with a schedule like this, and the amount of energy he puts forth, he’s going to be a string bean at the end of this rainbow. A timer flashed on the big screen, counting down to show time and the audience joined in at -10 seconds. Brooks bounded out on stage in his signature Wranglers and cowboy hat and the Pan Am went wild. 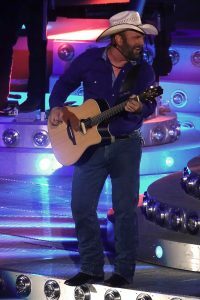 Garth grinned at the audience during his second song, “Rodeo” – and shouted, “You came to sing, right?” Roaring applause from the crowd proved that they, like Garth, were born ready. Garth jumped, ran, and climbed over all of the circular stage, radiating his energy to his fans for close to three hours. About halfway into the show Yearwood joined Brooks on stage for a touching version of “In Another’s Eyes.” She then broke out into “American Girl” and had the crowd in the palm of her hand. Yearwood introduced “She’s in Love with the Boy” by joking to the crowd that they should hit the restrooms, or get a beer during this song because the KISS Cam was going to be scanning the audience. Garth and Trisha ended this song with their own kiss, and she left for the remainder of the show. We wish Garth another 20 years of success. He’s a strange hybrid of Rock-n-Roll and country, but we sure like it. He has more fun than the audience and there’s no doubt, he loves his job. This is a super show and the entire band gets an A+ for energy, and effort.